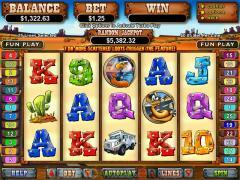 Coyote Cash is a video slot from the Real Series of slots from Real Time Gaming. The slot game has 5 reels, 25 paylines, and a maximum bet of 25 coins. Coyote Cash has a cartoon Wild West theme. The reels are set in a desolate and barren background. The main character, the Coyote, resembles the stupid coyote in Road Runner comics. The Coyote is the wild symbol and the Loot depicted as a big bag of gold coins is the scatter symbol. The Coyote is after the Loot. The other symbols are the Eagle, who is the sheriff, the Snake, the Cash Van, the Cactus and the Steer Skull. These are all depicted as cartoon caricatures. The high value cards from Nine to Ace make up the remaining symbols. Before starting the game players will have to choose the coin denomination by operating the arrows next to the BET button. Coin denominations are 0.01, 0.02, 0.05, 0.10, 0.25, 0.50, 1.00 and 5.00. 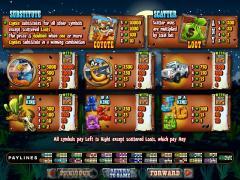 The player will also have to enable up to twenty-five paylines by operating the arrows next to the LINES button. Winning combinations pay only if they occur in enabled paylines. In Coyote Cash players are constrained to wager one coin per line by default. Once the settings have been completed the game can be started by clicking the SPIN button. Coyote is the wild symbol. 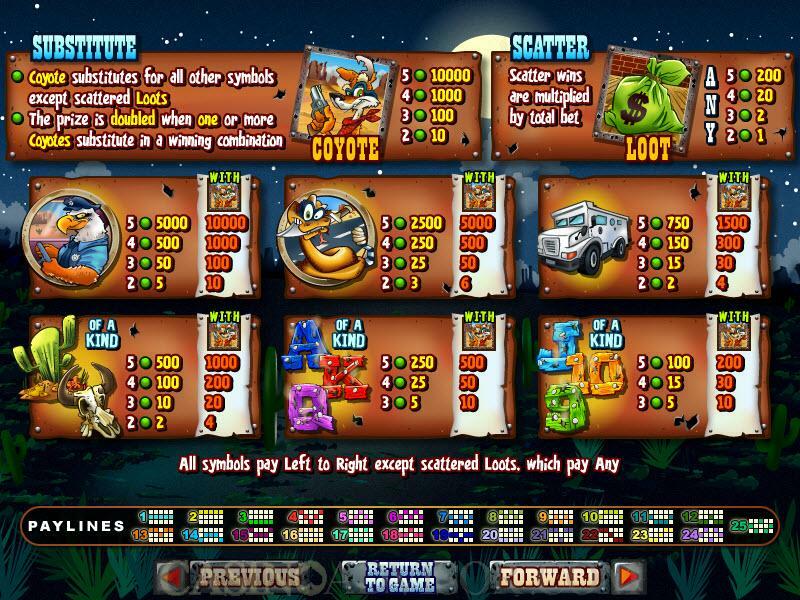 It offers the highest jackpot of 10000 coins when five Coyote symbols appear in an enabled payline. The symbol also doubles payouts when it substitutes to make a winning combination. The second highest fixed jackpot is also a good one. It pays out 5000 coins when five Eagle symbols line up in an enabled payline. And if the wild symbol is a part of the winning combination then the payout is 10000 coins. The Loot is the scatter symbol. When two or more scatter symbols appear anywhere on the reels they lead to scatter payouts. Five Loot symbols offer a scatter payout of 200 coins, which is multiplied by the total bet. 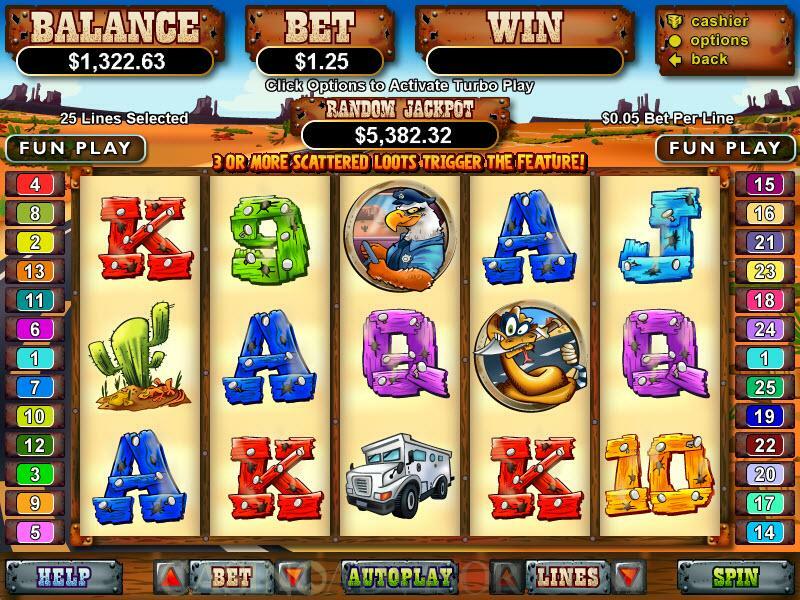 Three or more scatter symbols trigger the Coyote Cash free spins feature. Players are offered 20 free spins with a multiplier. For 3, 4 or 5 scatter symbols triggering the game the multipliers are 2x, 3x or 4x respectively. Additional free spins can be retriggered but function at the original multiplier. There is no bonus game on the second screen. The payout table can be accessed by clicking the HELP button. Coyote Cash has a progressive jackpot that is hit randomly. It does not depend on the wagered amount and does not require any winning combination on the reels. Interested in reading more detailed information about Coyote Cash? If so Click Here for more details.